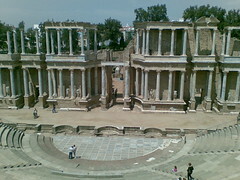 Mérida (Auguatus Emerita) is fantastic. One can understand why the Romans chose this place as their capital of Lusitania. Arrived early walking only 16 km to visit the museum, bridge, amphitheatre, forum, temple, etc. Have taken many pictures. Tomorrrow will past the impressive aqueduct on the way out of town.